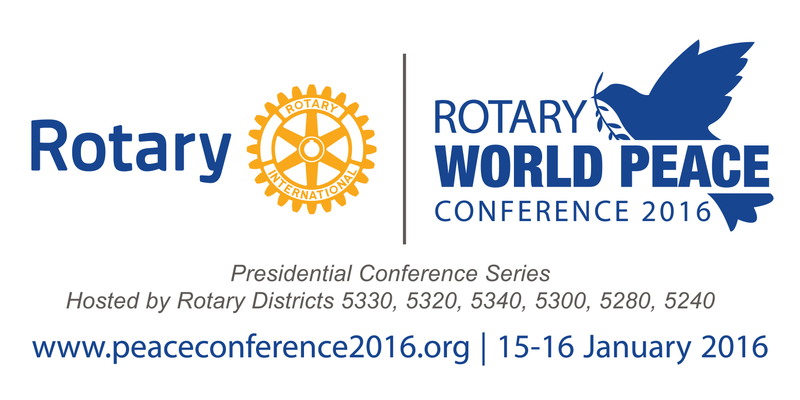 The Rotary World Peace Conference 2016, the first in the Presidential Conference Series jointly hosted by RI President K.R. Ravindran and Rotary Foundation Trustee Chair Ray Klinginsmith, will focus on peace and conflict prevention and resolution. Imagine more than 3000 community and business leaders, Rotarians and non-Rotarians, sharing solutions to major problems such as homelessness, human trafficking, domestic violence, child abuse, poverty, the refugee crisis, and other current pressing needs. Imagine taking a blueprint solution with you and receiving support to create real lasting change. The conference, the only one of the series being hosted in the Americas, will take place 15 and 16 January, just ahead of the 2016 International Assembly in San Diego, California, USA. The two day event will be packed with six plenary sessions, 104 breakout sessions with more than 100 experts facilitating the training classes, an interactive House of Friendship, dinners with special invited speakers, and a concert featuring world class violinists from Russia. A concurrent Interact Conference will provide training in conflict resolution skills to nearly 500 high school students. The conference will bring together experts with solutions to major issues which are occurring in each of our communities around the world. These solutions are divided into thirteen tracks including personal lives, home, school, business, international, international trade, film and media, major religions, Rotarians creating peace worldwide, civil rights and aboriginal needs, Peace Fellows, diplomacy, and sustainability. All people deserve the right to live in peace. As Rotarians, it is our responsibility to Lead the Way to Peace in the World. Who will be attending? Community and business leaders, Rotarians and non-Rotarians, from all sectors of society will be joining together with RI President K.R. Ravindran, Chair of the Rotary Foundation Trustees Ray Klinginsmith, past Rotary International presidents, Rotary Foundation trustees, Rotary directors, zone leaders, district governors, past district governors, district governor-elects, club and district leaders, club members, Peace Fellows, members of Rotarian Action Groups, Rotaract members, and Interact members. What will I take away from the conference? The Rotary World Peace Conference programs will be interactive and informative. They will provide you with solutions and encouragement to agree on plans of action. An established set of metrics will help measure results and track solution implementation. For Rotarians, this will lead to creation of sustainable district and global projects using funds invested through The Rotary Foundation. We hope you join us in Ontario, California, USA, on 15 and 16 January. REGISTER NOW by visiting our website www.peaceconference2016.org. Special Rates for Registration and Rooms Available Now! I made attempt to register online for the conference but I discovered that Nigeria is not listed on the list of countries. Attendees from countries that do not appear on the list of countries are still more than welcome to attend the conference but are not able to pay the registration fee online. Please contact info@peaceconference2016.org to complete the registration process.